It’s Banned Books Week and I’ve been discussing issues of access. Today the Boston Globe has this alternatingly irritating and sweet article this week Bookmobiles’ final chapter?. Forgetting for a moment that they broke the cardinal rule of using dippy headlines to downplay whatever seriousness the article might have had, this story talks about the demise of the bookmobile at the same time as it reports on the Beverly Public Library’s fundraising attempts to buy a new one. It seems, again, like a reporter has decided on the article they wish to write before actually learning about the topic and if I were the Beverly Public Library I’d be pretty annoyed that this article frames the bookmobile idea as something from a bygone era. The article doesn’t even have the wherewithall to cite any actual data preferring to allude to experts saying “Some blame skyrocketing gas prices. Others say bookmobiles became irrelevant in communities where residents can get easy access to other resources, such as the Internet.” The caption of the photo even puts the word “Bookmobile” in quotes as if it’s some weird made-up library word. Do people really think that the Internet is replacing the bookmobile? I’d be much more inclined to think that increasingly mobile patrons and the increase of decent school libraries has done more for making the bookmobile less needed. We still have bookmobiles, part of the year, in rural communities here. Heck we have a mobile DMV vehicle that comes to remote towns to help people register their cars. Not everyone can drive the 45 minutes from here to the DMV, particularly if their car isn’t registered. The ALA is the voice of reason in this article, with Satia Orange quoted as saying “There are communities where bookmobiles are the primary place to get information, in rural areas where getting to a library is difficult or a low-income area where computers are not in every home, where people cannot afford to buy books.” Let’s keep in mind that if you’re rural enough to not have a nearby library you probably also don’t have nearby broadband. I often hear librarian stories about how going to the library as a child changed their lives. I’m not a librarian, although doing this for 11 years now makes me pretty close to one, but some of my fondest memories are of the bookmobiles that served the Navy housing areas in Middletown RI and than Honolulu Hawaii. The Navy bookmobile, in my memory, was this huge grey vehicle that came to the corner of my street once a week and you could get a couple books and keep them until the bookmobile came back. How exciting! I think I read every science fiction and mystery title they had! School libraries improving, internet everywhere….phish posh….just ask the Amish families that many Ohio library bookmobiles serve or the teachers from the small private or charter schools that use our bookmobile. There should be more bookmobiles! Make them into mobile computer labs, or rolling teen clubs or whatever. But don’t think that bringing library services to our users where they are just means having a fancy MySpace. Many bookmobiles are mobile labs. I don’t think bookmobiles are dying out, but they are extremely expensive to maintain. Often, a new bookmobile with no frills are $250,000. I was able to avoid this by converting a ford f-350 and getting shelving and a sattelite dish. All for one tenth the price. Everywhere we stop we can offer 1,000 books and 10 inte net stations. I agree Jessamyn–irritating with a touch of sugar. I can’t comment on the Beverly Public Library system, but I can comment on my own public library. We have a bookmobile and it is wildly popular. Stops increased over the past few years from about 20 to about 35, 40 I think. Maybe more–I don’t work there any longer, so I’m not sure. It’s not just retirees and shut-ins who use it. A large number of users are urban dwellers who live in underserved areas of the city. Everyone loves the bookmobile! It kind of sounds to me like they have this vehicle, but no one maintained it. That is an important, yet costly, requirement of bookmobiles. I hope they can raise the money to purchase a new one and encourage community support so that the community leaders can see that this is an important asset and service of the public library. What I find irksome (and quite common) is this idea that people no longer need books because they have the Internet. This formula does not really work, does it? How many books are even on the Internet? (well, ok, there are a lot now, but mostly those in the public domain) But of those that are, how many people really prefer to either read an entire book on their screen, or print out an entire book, or read from one of the many unsatisfying electronic readers? I don’t understand the talk that libraries (and bookmobiles) are becoming obsolete, when I don’t really hear the same talk that bookstores and book publishing are obsolete. It seems to me like this widely accepted faulty logic has taken hold of the mass consciousness. I guess the scarier implication is that the people who don’t think books are necessary because of the Internet, must not have read many books, or else it would be obvious to them that there is a huge difference, particularly in terms of depth, between reading a book and the type of skimming and glancing that makes up most people’s Internet reading experience. I have been a librarian for 30 years and every library system I have worked in (4 different states) has had a bookmobile program. The most successful programs were in: (1) a rural 3-county system in Virginia and (2) a county system west of Denver where the bookmobile made stops in suburban neighborhoods as well as rural areas in the foothills of the Rockies. Both of those bookmobile programs are alive and well. I currently am the director of a public library in a suburban “growth center” community in Vermont; we have just taken our bookmobile off the road after 4 years of service — but NOT because the bookmobile no longer has value. Our bookmobile made stops throughout our community and was most popular in neighborhoods with children/families and in lower-income areas where families have no transportation to the library and/or have limited English language skills. Our dedicated bookmobile staff made important personal connections with the people who used the bookmobile and witnessed how this kind of mobile service really does bring positive change in people’s lives. Folks love the sense of community and personal service that a bookmobile brings — and children love the experience of a “library” in their own neighborhood. One student commented on how it helped her with homework assignments and school reports. Parents borrowed piles of books to read to young children. Immigrants, who were at first hesitant to step on board, discovered a wonderful free service for their families, got to know their neighbors a bit better, and improved their English skills. Adult readers enjoyed browsing for books to read. We did not have live Internet access but the vehicle was “wired” with the idea that someday we could use it as a mobile computer lab. This is what we learned: folks did not want to come on board to use a computer; they wanted books and other library materials. Why did we take our bookmobile off the road? We purchased our vehicle via a generous grant from the Vermont Department of Libraries/Institute of Museum and Library Services. We hired two permanent staff members to operate the program and we created a year-round schedule of regular stops. We developed a loyal bookmobile user base and made a regular appearance in the 4th of July parade. But in the end, we had to face the economic reality. Bookmobile service in our relatively small community was expensive (staffing being the major cost.) Bookmobile use declined in the winter months. Many of our bookmobile users are also regular library users and the community of people who have no other access to the library is relatively small. Because the bookmobile travelled only short distances we had multiple mechanical problems. We are now re-thinking our program and plan to sell our bookmobile and (we hope) replace it with a smaller vehicle that will provide mobile library service during the summer. Bookmobiles are great — and mobile library service is still very valuable in the 21st century. Vermont has some very successful bookmobile programs — each is tailored to the local community’s needs. Our plan is to develop a library outreach program that best meets the needs of our residents — and we hope that we will have some kind of mobile service up and running next summer. I’m the director of the Beverly Public Library – the one that’s raising funds for a new Bookmobile – and yes, we ARE pretty annoyed. The article plainly states people USED to be happy to see it but no more … which is so far from the truth that it is laughable. Our bookmobile librarian is so overworked she is exhausted. In FY 2006 she accounted for 17% of our circulation – that increased to 18% in FY 2007. Does this seem like a “driver” (rather a demeaning term for a dedicated woman with a Master’s degree) clinging to the past? Linda single-handedly circulated almost 60,000 items out of that bookmobile last year. Our “town” (Beverly’s been a city since the 1890’s) officials did not refuse to fund it – a fact I made very clear to the reporter – but have not been asked. Due to the financial situation of the city and it’s pressing need to build a new high school, I decided that fundraising for most or all of the cost would be a better alternative than waiting until a new bookmobile could be funded through revenues. We’ve also raised close to $10,000 dollars in just a few months – another fact the reporter somehow “misinterpreted” down to $900. Like other commenters I am baffled by people who think everyone has access to and can get anything they need off the internet. Given Beverly’s experience (not rural, but a commuter suburb of Boston) the elderly, the disabled, familes who can’t afford a second (or even a first) car, schoolchildren and day care centers everywhere could benefit by increasing bookmobiles and their delivery of all those non-internet goodies, such as large print books, picture books, and the joy of interacting with a trained librarian who can find that perfect book, “just for you,” no matter what your age or interests. 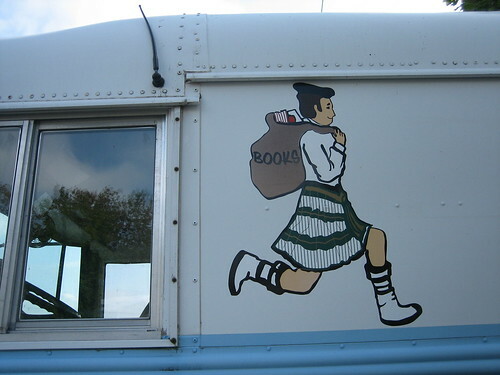 We’ve actually had quite a few inquiries in the last couple of months about bookmobile service. We’re a one-branch library in the county seat of a rural county, and we’ve had a volunteer-run mobile service to one of the other towns out of milk crates in the back of the volunteers’ personal cars. But things happened, people got busy with other stuff, and the service fell apart. Now this and a couple of the other unincorporated villages are making noises that they pay taxes (quite a lot of taxes, in some cases, where ranches can run in the hundreds or thousands of acres) and dammit, they want library services too. It’s easy to forget, with multimillion-dollar urban district budgets and Internet-based services, that there are still places in the United States that have never had permanent library buildings, and do not have broadband Internet coming in the forseeable future. Which goes back to your post from last week. For these communities, the bookmobile is still one of the best, most economical solutions available. I have noticed that even in Queens, NY, a tremendous urban area, the Queens Public Library brings out a vehicle which I am assuming is a bookmobile at various street fair/family day events in parks throughout the summer. I have noted that they are much more likely to bring out their bookmobile to such events when they take place in a poorer neighborhood. I found this to be interesting, but am unsure as to why… perhaps it is a way to encourage library use amongst the economically disadvantaged – folks who might be less likely to have the time to make an express visit to the library? Jersey City Free Public Library has raised funds to outfit a brand new bookmobile which should be on the road, uhm, soon!!! One of my local library services has an awesomely swish bookmobile – absolutely huge, satellite connection and a lot of stops. I got to work on it for a day, which was lovely. Problem is that it requires a HC (truck) license which requires specalist training (it’s akin to a semi-trailer) – not many librarians have this training. They can’t afford a driver and a librarian. So one of the truckies who used to do horticulture work but injured his neck is now the bookmobile librarian. Which works okay in the area (most of the bookmobile patrons are related in some way to truckies or at least in a similar area of work) but it’d be nice to have an actual librarian able to work with them. As I noted elsewhere, I live in a small city (72,000) with a multimillion-dollar library budget–a small city that’s also in the heart of Silicon Valley and has universal wifi (at least outside). And has a library bookmobile, because it’s needed and used. Paid for by Google, by the way…not surprisingly, since this is their headquarters town and so many Googlers live here. So much for “it’s all on the internet, who needs libraries?”–or bookmobiles, for that matter. Good for Jessamyn West! Once again, media myth trumps reality. Millions of people, and most often those who most need and have least access to library services, are served by bookmobiles, medimobiles and internetmobiles.